Please note: This item is only available for delivery until the 23rd June. A must for anyone who loves pink, this bouquet combines wonderfully fragrant roses ranging in colour from palest ballet-shoe satin to deepest blush, combined with scented sweet peas freshly picked from our English flower farms. Exclusive to The Real Flower Company, Peony Pinks, with their vanilla scent, delicate shell-pink hue and distinctive shape, are one of our favourite roses. 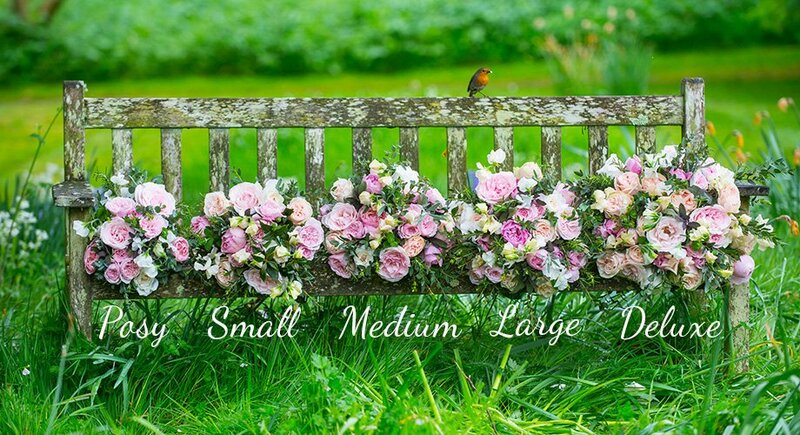 Here our expert florists have hand-tied them with David Austin’s charismatic, deep-pink Carey and the paler hued, classically shaped Pink O’Hara. The roses are complemented by stems of vibrant magenta sweet peas and seasonal herbs and foliage. The roses in this bouquet are grown on The Real Flower Company’s Fairtrade sister farm in Kenya and flown in using surplus capacity on passenger planes to minimise their carbon footprint. Sweet peas come freshly picked from our Chichester flower farm in the UK. The bouquet is available in Small (11 Roses), Medium (14 Roses), Large (16 Roses) & Deluxe (28 Roses). The bouquet photographed is a large size.